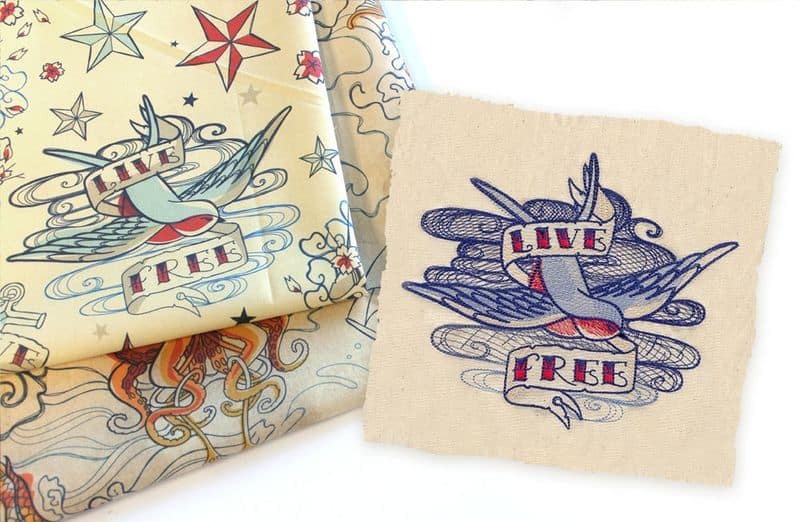 An Exciting Giveaway from Spoonflower + Urban Threads! Calling all embroidery enthusiasts! This week we're excited to partner with the friendly folks from Urban Threads to offer one lucky winner the chance to take home a lovely little embroidery bundle. 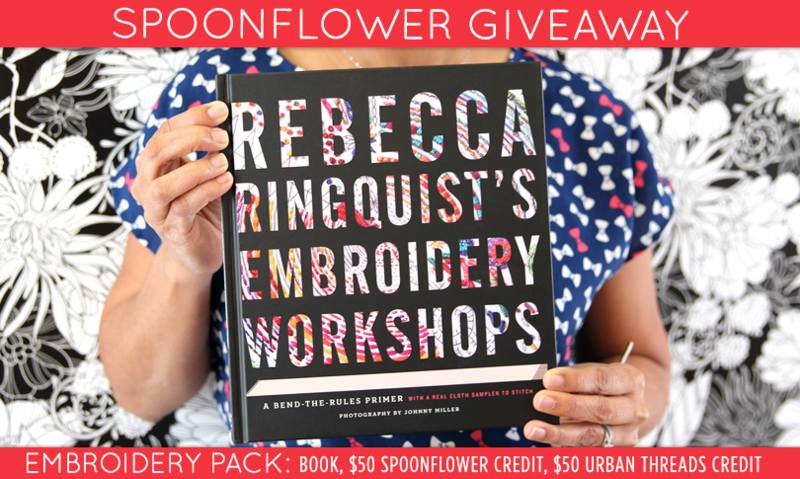 Included in this week's giveaway is a $50 Spoonflower credit, $50 gift certificate to Urban Threads and a copy of Rebecca Ringquist’s Embroidery Workshops: A Bend-the-Rules Primer. This book is for the embroiderer who appreciates the value of beautiful stitches but also likes to break a few rules along the way. Rebecca Ringquist’s Embroidery Workshops is a refreshing new resource for both standard and out-of-the-box techniques. This wonderful book teaches everything from the “proper” way to form a French knot and transfer a design to a canvas to new ways to stitch three-dimensionally, work with nontraditional threads and fabrics, draw with thread freeform, and mix and match machine- and hand-stitching. Enter by Tuesday, May 5th, 2015 for a chance to win. The winner will be contacted via email on Wednesday May 6th. The competition was tough, but in the end Italian designer Francesca Besso (Chicca Besso on Spoonflower) captured the hearts of voters and our judges at Urban Threads with her Octopuses in Love design. Francesca will receive a $100 cash prize, and an element from her winning design will be adapted into an accompanying embroidery pattern offered by Urban Threads. All of the top ten this week will receive $50 in Spoondollar credit. Check out all of the top ten! 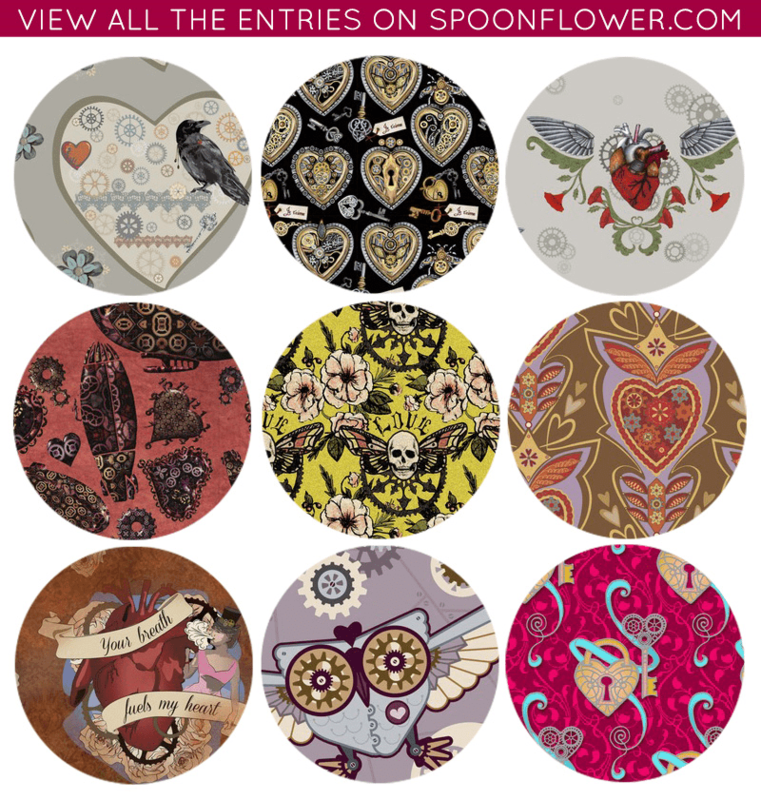 Vote for Your Favorite Steampunk Valentine Fabric! Ah, the heart. It is an unpredictable and wild thing…unless you add some machinery and a little steam power. Check out the romantic fabrics submitted for the Urban Threads Steampunk Valentine Design Challenge and vote for the design you think would make the perfect embroidery pattern! We are so excited to partner with Urban Threads to help add a new embroidery pattern to their amazingly fresh and offbeat library of designs! Urban Threads, creators of beautiful machine and hand embroidery patterns, love offering coordinating fabrics for their embroidery patterns–their Spoonflower shop features tons of “fabric designs to rock your embroidery,” in fact! 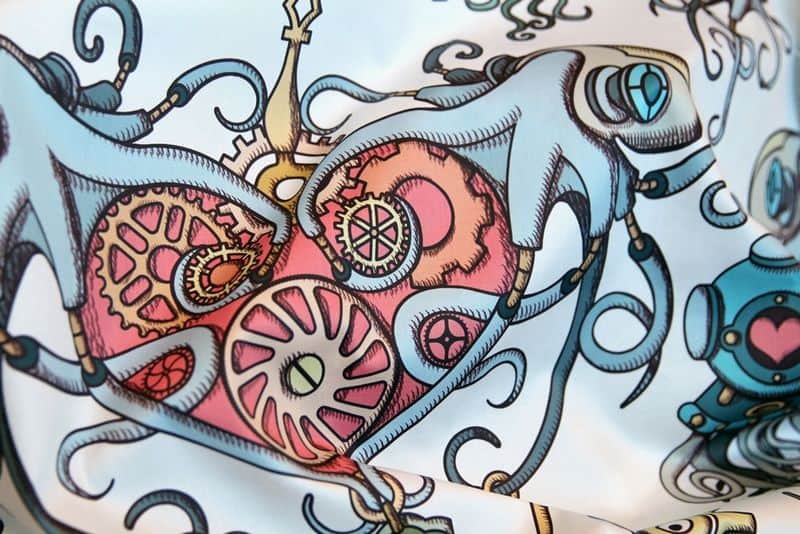 Together, we’re giving you the opportunity to design a Steampunk Valentine themed fabric, and they will create a coordinating embroidery pattern for the winning design! WHO: Spoonflower and Urban Threads are teaming up for a very special fabric design challenge. WHAT: Our Steampunk Valentine Design Challenge seeks designs from which a lovely Steampunk Valentine’s themed embroidery pattern can be adapted by Urban Threads. The winner of this contest will work with Urban Threads to create an embroidery pattern to coordinate with their fabric design. We’re not designing embroidery patterns to be stitched in this contest, but patterns with a Steampunk Valentine theme that can be adapted to have accompanying embroidery elements offered through Urban Threads. Check out their handy Style Guide here for a full explanation of the types of designs that work well as embroidery coordinates. The good folks at Urban Threads will choose one winner from the top ten vote getting designs. The winner will receive a $100 cash prize from Urban Threads, and all top designers will receive $50 in Spoondollar credit. WHEN: The design deadline is February 3, 2015. Voting will take place February 5 – February 11, 2015. The top ten designs and the four winners will be announced on February 12, 2015. The final embroidery pattern will be offered by Urban Threads in the coming months. HOW: To enter, create your own Spoonflower account, upload an original fabric design to the account, and enter the design in the Steampunk Valentine Embroidery Coordinate contest using the drop-down menu for entering contests. Designs should be created especially for this contest, and all artwork must be your original work and should not include clip art or other available Valentine’s Day-themed artwork. A note about your design file: Urban Threads will need a high resolution jpg (at least 300 dpi and letter size) or a vector file to create the resulting embroidery pattern. We encourage you to prepare your original file for this, but you should create a copy of your file saved to 150 dpi to upload to Spoonflower. Your Spoonflower preview will be viewed at 150 dpi in a fat-quarter size (21” x 18”). See the full details and official rules here. Welcome to the penultimate day of our 12 Days of Giveaways! The embroidery fans among you will appreciate that we’ve asked Niamh O’Connor, creator and “Evil Genius” behind Urban Threads and an excellent Spoonflower designer herself, to curate a bundle of 12 fat quarters from the Spoonflower marketplace, and she was totally up for the challenge! On offer today are Niamh’s 12 picks in a steampunk theme and the result is a pile o’ steampunky goodness printed on 100% Kona cotton! We’re also throwing in a selection of Guterman thread to aid you in your nefarious plan to stitch up a mad steampunk quilt. We think they’ll make an amazing quilt for your favorite steampunk fan (or for you to keep yourself). Links to each of Niamh’s fabric picks are below. Enter before 8:00 am Tuesday and we’ll announce a winner a little later that morning when we announce the twelfth and final giveaway of the 12 Days. Good luck, everyone, and congratulations to yesterday's winner of the vintage Simplicity patterns, Ginger Clark!